Celebrate New Year’s Eve at Elysée! If you neither feel like staying at home nor being in a crowd, listening to thundering music or going to a hotel with most expensive Xmas package. Or just wishing to have some nice meals or drinks as a party-kick off, than ELYSÉE is the place to go to! 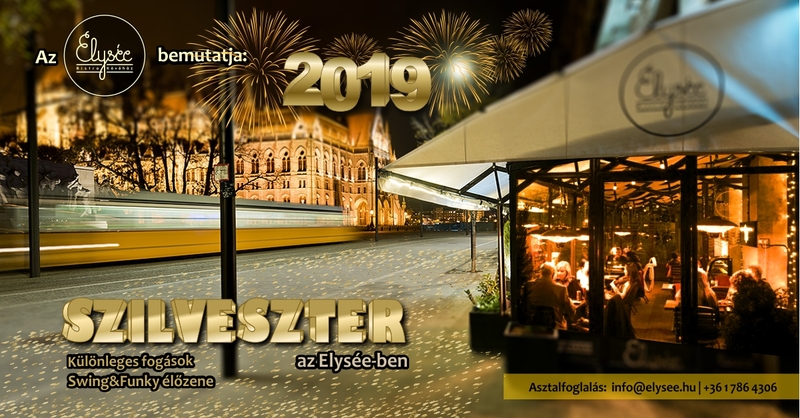 There is the brightly lit Kossuth tér as a background, and this year you can reserve tables on our heated terrace as well (in case you ONY would like to have drinks)! We offer a special menu for our guests for this evening. The fixed priced menu is including any 4 dishes from our special New Year’s Eve menu, a welcome drink, a coffee, a water, and a glass of champagne and some bites at midnight. Menu price: 15.900 Ft + 12,5% service fee. Reservations are only accepted when a deposit of 8.000Ft/person is paid in advance. To reserve your seats please call 06-1-786-4306, or send email to info@elysee.hu or in messenger. Inside tables are only for dinner guests! No extra entrance fee!